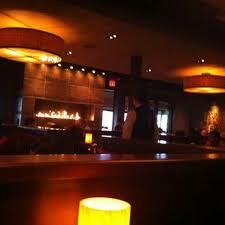 Saturday night, my family went to the Stanford Grill in Columbia. My mom, step dad, and Lilly had been before, but Nick and I hadn’t. The best thing I can say for it was that they had live jazz, which is apparently a nightly occurrence. The service was good and the food came out quickly, and our waiter, Jesse, was really helpful with explaining specials and helping us decide what to eat. We had the appetizer special, which was raw tuna, avocado, and pineapple in a light, spicy pineapple seasoning. It didn’t look very appetizing, kind of like a school cafeteria fruit salad, and this impacted how I felt about the taste – a little too exotic for an appetizer, and too many flavors that didn’t mix very well. We also ordered their coconut shrimp, which were a little overcooked! However, they were crispy and the sauce that came with them was wonderful. Jesse was good about answering my gluten-free questions, and I decided on their hickory grilled tenderloin filet, with potatoes and spinach. The mashed potatoes were excellent, but the tenderloin wasn’t memorable, and Nick actually finished it for me. Lilly got the pot roast, which was probably the best plate at our table. It was exactly the right consistency, and came with mashed potatoes and stewed veggies. Nick got the salmon, which was delicious – perfectly cooked and seasoned; however he said that the butternut spaghetti squash alongside it was a little sad. Dessert was disappointing for me. They don’t have a printed dessert menu, so the waiter spouted off about 7 or 8 options, which were hard to remember, and none of which sounded that great. The only gluten-free option they had was a creme brulee, which was well done, but it would have been nice to have other choices. Lilly tells me that the pineapple upside down cake was good, although a little rich, and the pistachio ice cream also got a “yes”.